by Bill Dwight on Monday, March 28, 2011 at 3:26 PM | LEAVE A COMMENT! 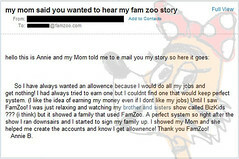 Earlier this month, I was on the phone with Diane B., a new FamZoo Mom from Washington state, helping her set up her family’s allowance and chore system in FamZoo. By the way, if you need a hand with your setup, just contact us any time. We’re always happy to help, and we really pride ourselves on our personal, responsive service. On the call, she mentioned that her 12 year old daughter, Annie, was the one who had found FamZoo, registered the family, and delivered the initial demo & sales pitch. Nice. FamZoo’s Marketing & Sales Department — err umm, that would be yours truly — could really use Annie on the “team”! So I have always wanted an allowance because I would do all my jobs and get nothing! I had always tried to earn one, but I couldn’t find one that would keep the perfect system (I like the idea of earning my money even if I don’t like my jobs) until I saw FamZoo! I was just relaxing and watching my brother’s and sister’s show called BizKids ??? (I think) but it showed a family that used FamZoo. A perfect system. So right after the show, I ran downsairs, and I started to sign my family up. I showed my Mom. and she helped me create the accounts, and now I get allowance! P.S. For those who haven’t seen it, the FamZoo segment in the BizKids show that Annie saw is here.